Earlier this week I collected two large sacks of sheep fleece. I had asked the shepherd to call me when he was shearing as I wanted to see how it was done. Either it was lost in translation or he didn't want an audience. When Steve met him by chance at the post office early one morning he said the fleece was ready for me. As you can see the inspectors are giving it the once over before anything can be done with it. 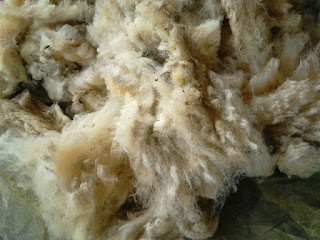 This year there appears to be less lanolin in the wool, less vegetable matter stuck in it too - which is good! The poo is still there it comes with it free so I can't complain. The poo ends up in the compost so nothing is wasted! The last time I cleaned this much fleece it was dire. It took 4 or 5 washes with detergent and then several rinses. 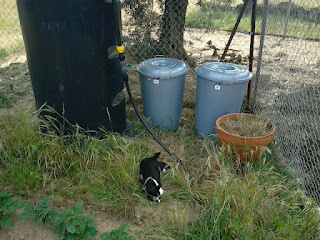 And because we have an ecological waste system I tried to spread the waste water around the finca. It was really hard work and it used so much water I wasn't looking forward to doing it again. But then, I heard about the Suint Bath! 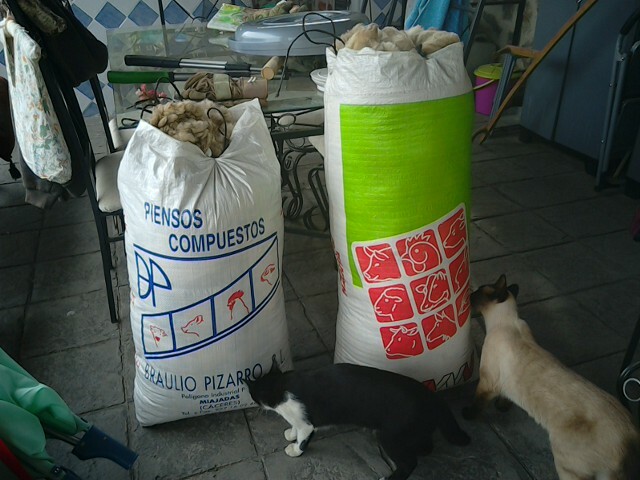 This is a method of cleaning the fleece using very little ​water, NO detergent and it doesn't remove the lanolin, which is nice because the natural lanolin in sheep's wool helps with the spinning process. This sounds too good to be true so I decided to conduct an experiment to see if it works. 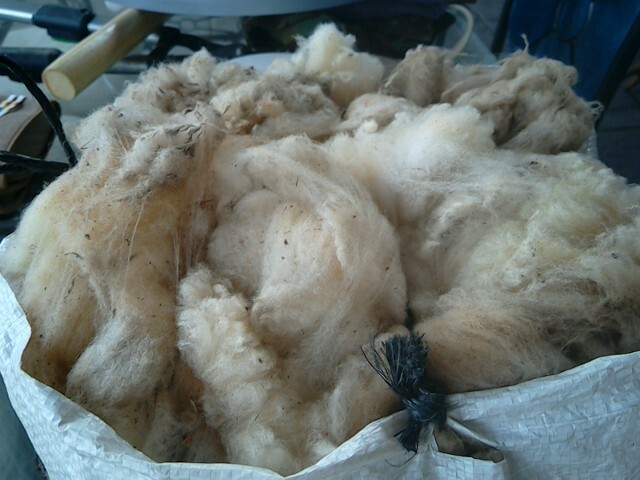 The Suint is a substance made up of sweat and potassium salts which naturally occur on the sheep's skin. 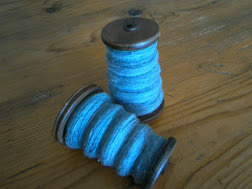 It's purpose is to force dirt towards the outside edge of the sheep's wool. 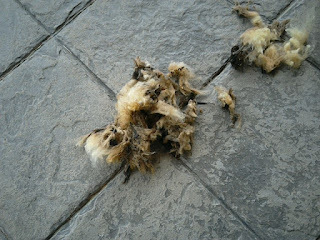 And you can harness it's cleaning power after the sheep has been shorn. You fill a sealable bucket with rainwater and after removing poo and excess vegetable matter from the fleece you soak the fleece in the water. 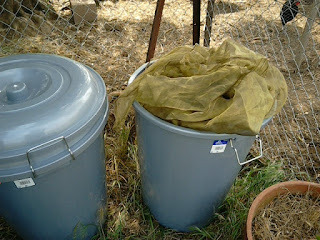 I put the fleece into an old net curtain to make it easier to remove when the process is finished. 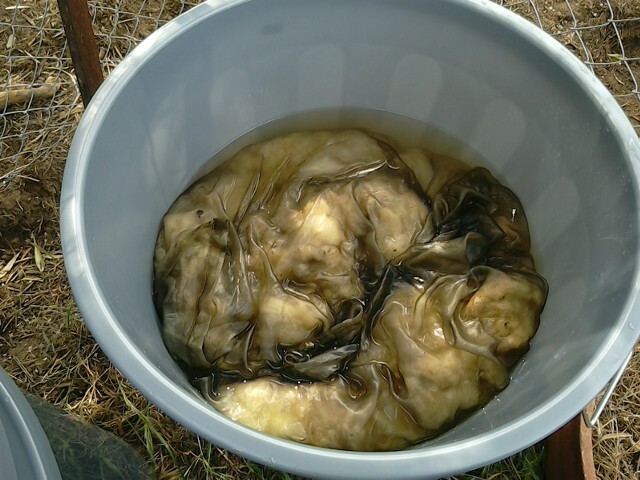 You close up the bucket and leave it for a week to ferment. Yes, FERMENT! After a few days it should start to bubble a bit. This is the Suint working on the fleece. When you remove it from the bath it should only need rinsing. Now, I've just begun the experiment so I haven't actually got that far yet. 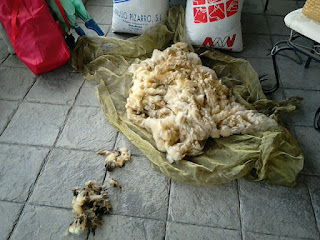 The really cool thing is that you don't throw the fermented Suint water away, you simply add more dirty fleece to it. 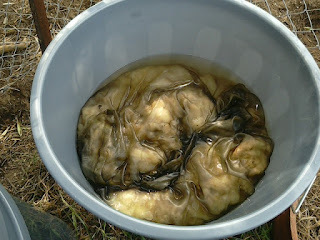 Subsequent fleeces should only need two or three days to clean as the fermentation​ gets stronger. Sounds too good to be true doesn't it? Well apparently there is a downside. It smells like Hades I am told. I shall certainly keep you posted on this. Here are my two Suint Baths in the veggie garden right next to the rainwater container. Oh and the inspector followed me here to make sure everything was in order. The Suint Bath can be kept going until all your fleeces are clean or until it's too thick to swim in but too thin to plough, whichever comes first! And when it's finally finished with, it can be put on the veggie patch as it's full of the kind of natural yummy-ness that vegetables love.